I'm not normally a germophobe, but now that we've entered the season in which everyone seems to be feverish, phlegmy, or recovering from some Unspeakable Gastric Event, I've definitely become sensitized to all the ways germs can be transmitted from person to person and (inevitably) to me. I actually have fond memories of childhood colds, missing a day or two of school, stretched out on the couch watching reruns of “Alice” and “Diff'rent Strokes.” But as it has with everything else, adulthood has sucked all the fun out of illness. Now if I'm under the weather and I want to stay home, I have to take a vacation day. And really, is there anything worse than being sick on vacation? My anti-germ strategy is as simple as it is ineffective: don't touch anything that a sick person might've touched in the last 72 hours, including: door knobs and handles, drawer pulls, light switches, and elevator buttons; other peoples' computer keyboards, mice, and cell phones; toilet handles, faucet handles, and paper-towel dispensers; shopping carts, self-checkout touchscreens, gas pump payment keys, all of the world's credit card signing pens, and anything in an ATM vestibule; and, naturally, the steering wheel and shifter of the loaner car I had to drive while my car was in the shop the other day. Yes, this can be a challenging way to live, especially when you start counting the sheer number of doors you pass through on a daily basis. But this is why someone invented elbows, sleeves, and hand sanitizer, right? I was bowling with my family recently when it struck me what a fantastic germ distribution apparatus the ball return system is. 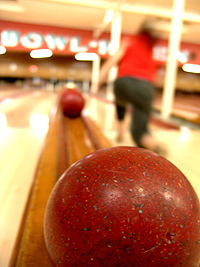 You grab a ball, rub your germy hands all over it, and then roll it off down the lane. The machine shoots the ball right back and somebody else grabs it—perhaps even someone from the next lane over—and adds their own personal microbial mélange to its surface before passing it along again. This happens over and over again…pretty much forever! Yum! Anyway, despite my efforts, I awoke one morning a few weeks back with a jagged lump in my throat that just wouldn't go away, and all I could think was, Where did I go wrong? What did I touch that I shouldn't have touched? And most importantly, Whose fault is this!?!? If I had to put money on it, I'd blame the FedEx guy. He ambushed me with a package at work, popping out of nowhere and demanding a signature on his little electronic clipboard. Seeing no escape, I reluctantly signed using that plague-ridden plastic stylus he'd been dragging from delivery to delivery for his entire career. But as I was signing, I wondered, Why is this even helpful? You can't read my signature...I could scribble anybody's name there. Couldn't he just snap a photo of me holding the package? That would be infinitely more sanitary, probably more useful, and way more fun. Just imagine the scrapbook he would've amassed by the end of the year! Like your picture? Send it to Facebook! Order Christmas cards! Or a framed 8 x 10! This quotation is from a character named Bethany who, even within the book's fictional world, is just a Gothed-out Staples employee with no medical training, but I find it reassuring nonetheless. I'm planning to have it engraved on a wall plaque for when I finally open my own bowling alley. Whenever I hear the phrase "ATM vestibule," I think of Chandler Bing being trapped in the ATM vestibule with Jill Goodacre. Which is infinitely more pleasant than thinking about the sheer number of germs I came into contact with today as I recklessly (or ignorantly) touched all sorts of public surfaces . . . By the way, I bet Chandler would be totally skeeved by all the germs in the aforementioned vestibule. In my original draft, I wrote "anything in an ATM vestibule (including Jill Goodacre)," but I didn't think many people would get the reference. Plus, I didn't want to risk getting Harry Connick, Jr. all pissed-off at me again. 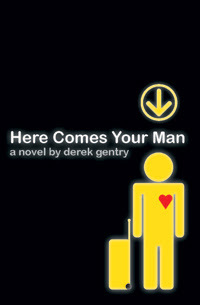 Derek, I found your book "Here comes your man Delightful. I live in Erie Pa but was was born in Hingham. Love stories about home. Thanks, Dot--I'm so glad you enjoyed it!